Knights of Creativity Spirit & Ale: What the Hex? One of the nicest chores I sometimes get given whenever i go "home" to Harrisburg, Pennsylvannia, is paint up some Hex signs. 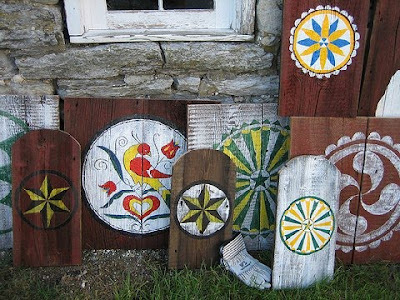 Decorating everyday items with colorful designs was a common practice for the German Lutheran and Reformed settlers of Eastern Pennsylvania. Furniture, to clocks, to birth certificates were decorated with symbols and motifs which the first settlers had been acquainted with in Europe. Many of the motifs used in these decorations included birds, hearts, tulips and very often, geometric designs which would immitate the stars, sun, and moon. 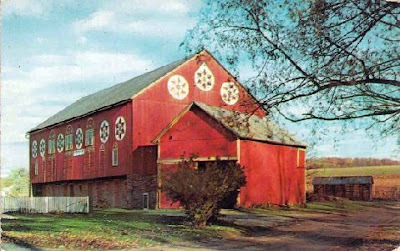 Sometime in the mid 19th century folk artists began to transform the old geometric designs by enlarging them and painting them on barns. 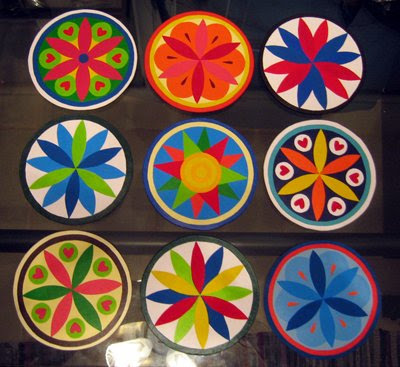 The most popular hex signs were six-sided, brightly colored geometric designs. The german word for six is 'sechs' and this word evolved to the present-day hex. These designs would get the name Hex Signs in the 1920's. It appears that the name and the legend of Hex signs was due largely to two events. 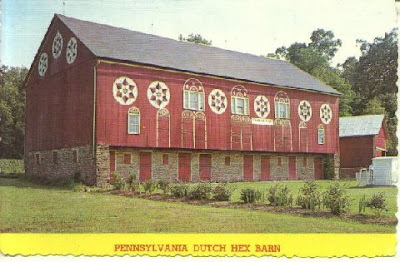 The first being a book by Wallace Nutting titled Pennsylvania Beautiful(1924) in which he raised the claim that barn signs were used to ward off evil and the second was a witchcraft-related murder in York County, Pennsylvania which attracted the attention of the news media and introduced the word hex into the American vocabulary. I have not found a lot of books written on the subject of hex signs but the ones I have found seem to have different opinions as to the purpose of the signs. 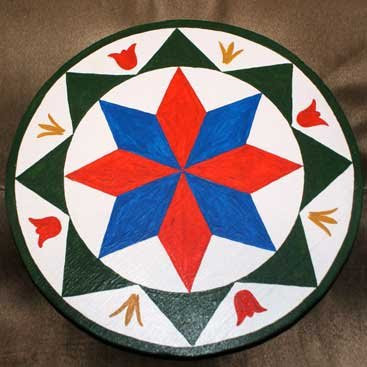 Although the purpose is debated, the motifs used in various hex designs seem to have universal meanings such as using hearts for love and tulips for faith. Back home in the UK... i have begun to wonder if there is a novel way of bringing the whole idea of the protection/good luck element of the Hex signs into the homes on this island.... The mention of Clockfaces above has now just made me think, here is an avenue to expand my business. Clock movements and hands are cheap by the dozen, I could call them the "If Not Now, When?" Clocks, Isn't it funny how I always get my bright ideas at Midnight when i should be thinking of going to bed. And you know, several of these designs can be made with wood inlays -- perhaps a combination of inlay and paint? How about buying an old barn on a couple hundred acres and starting a joint venture? 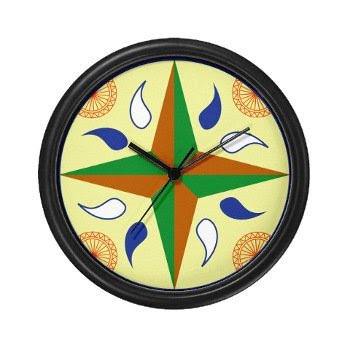 I think there is a market for the clocks! Yeah Bowie...the sharper geometric ones like the second to last picture are ideal for woodwork versions using light and dark woods. or simply veneers. without paints. wow...think i might try that last one myself. What the Hex is going on? I could guarantee that Hex clocks would sell in Eastern Pennsylvania. What the Hex time is it? Half past Hex.